I have an amazing doctor in San Francisco named Mark Savant. He's super responsive, listens to his patients and is a great communicator. When I came back from Chicago I looked him up on Yelp and found he had a ton of recommendations. When I went in for a checkup we talked about the power of the Internet to connect Physicians and Patients, as well as the huge impact reviews like Yelp (and someday Angie's List) have on a doctor's practice. I had my own stories to share from the patient networks I've been building with Ben Munoz (newest networks are www.ALDSupport.org & www.LivingWithFibro.org). Dr. Savant was very supportive and wanted to find a way to work together. Last time I visited him he told me about the new site he was launching called SavantMD. Together with his partner, Brian Colbert, they are building an information portal for patients to connect with doctors. He's assembled a very impressive group of experts and early this week, the site launched. It's full of great content and I encourage you to explore it. 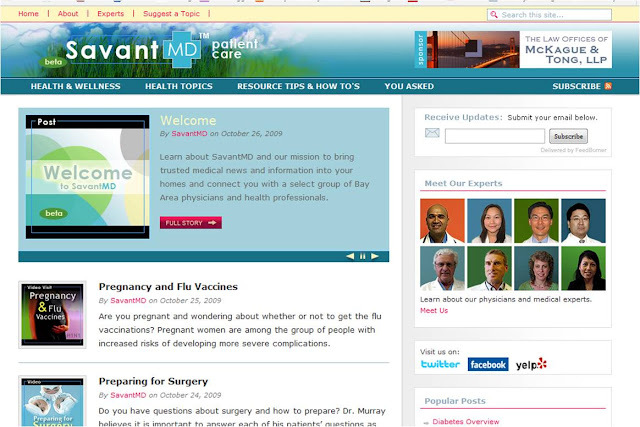 As part of SavantMD's launch, Dr. Savant will be taping informational video segments that we will be embedding on our patient networks. This is truly a new era in medicine and I can't wait to hear of all the benefits that patients get from it.